We were fortunate to have representatives from over 40 different Boston area organizations participate in the ThinkTank. It was a thrill for us to have access to an intimate setting like Workbar Back Bay where industry professionals who wouldn’t ordinarily have the opportunity to collaborate with one another were able to contextualize possible future scenarios, brainstorm, and identify opportunities across disciplines/sectors without any boundaries or barriers to inhibit their ideas. Holding this ThinkTank allowed Accelerate to build stronger collaborations and partnerships between the academic community and industry, as innovative minds came together to develop diverse and creative suggestions on how our cities could change for the better. The day opened with industry leaders sharing the human and city lens for each of their respective topics, highlighting a plethora of considerations and challenges that communities must address in order to survive and thrive in the future. Local leaders that helped to guide the human lens discussions included David Morgan (Future in Sight), Emily Shea (Elderly Commission for the City of Boston), Kate Tooke (Sasaki Design), and Kristian Kloeckl (Northeastern University). Insights for the city lens were given by Jose Manuel dos Santos (Philips Lighting) and Tom van Arman (Tapp/Netherlands), who shared scenarios and considerations on what our future cities may look like. ThinkTank participants were then asked to propose and ideate on “How Might We?” questions to drill deeper into the systemic considerations/challenges posed by these aforementioned topics. After hours of collaboration and brainstorming, our participants reported their ideas to fellow ThinkTank participants so that everyone could be apprised of the considerations/challenges in each of the unique opportunity spaces that were considered throughout the course of the day. Though each opportunity space was distinct and complex, we did see every group place an emphasis on ensuring that future cities are people-driven rather than merely becoming a laboratory for technological innovation/transformation. In this future of our cities, citizens would bridge the gap between embracing the importance of emerging technologies to improve the lives of all residents while also understanding that an overreliance on technology can impede human contact/connections just as easily as it can help create them. Based on the explorations in this ThinkTank, our team is confident that the future of our cities will be bright if we can continue to find opportunities for multiple generations to ideate on the most important issues that are impacting our urban environments. It was refreshing to see people of all ages, backgrounds, and experiences come together and ask “how might we?” instead of focusing on the obstacles/barriers that often impede progress in our communities. 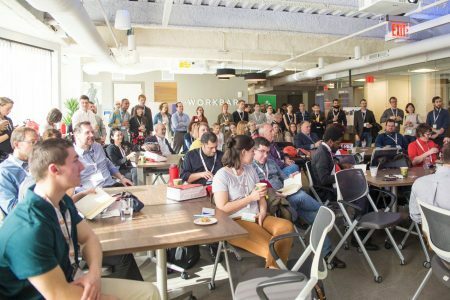 Interested in participating in a future Accelerate ThinkTank? You can stay updated on our ThinkTank schedule for the rest of 2018 and beyond by visiting bit.ly/futureofourcitiesinterest. Thanks for reading and hope to see you at our next ThinkTank!